As a sequel to “Spotlight: Study, Thinking and Writing Skills”, this book aims to further hone students' reading and writing skills situated in the research context. Reading and Research Take Center Stage is designed to reinforce and strengthen critical thinking and research skills of budding researchers as they face the various research-based tasks the academic and professional world demand. This book, which is a product of careful research, further aims to instil the values of scientific inquiry, sense of responsibility and discipline research entails. Emphasizing on the importance of research, the modules contained in this book guide the students to walk through the process of research and help them to recover, discover, rediscover, refine, define, or refine personal, social, economic, gender, environment and professional issues as reflected in the research articles coming from different disciplines. This purposive part includes specific primary and secondary skills which are clearly and concisely articulated to help set goals for the readers. This exciting starter warms up, encourages and stimulates readers' curiosity a varied and enjoyable activities are included to introduce the topics and prepare ther for the lesson. This priceless part serves as a bridge to the Audition and the actual reading selection by linking the preparatory activities and the subject being investigated by the research article through previewing the text. This extraordinary element prepares the reader for a closer reading of the text as students are engaged in a dialogue with the text/ author through annotation and effective note taking. 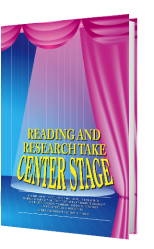 This special section provides explicit input for the focus reading skill, emphasizing specific strategies to demonstrate and develop the necessary skill for thinking, reading, and research. This practical part encourages collaboration between and among students as they are guided by their instructor in practicing or rehearsing the skills to prepare them for independent work eventually. This super section provides challenging and engaging opportunities for individual and collaborative application of reading and research skills presented. This section promotes careful and thoughtful reflection among readers to ponder on their strengths, progress and areas for improvement. This helps them become more self-directed and metacognitive learners. Various performance-based rubrics are also provided to ensure effective assessment of students' processes and outputs to aid students monitor their own learning and guide educators supplement and design instruction.